If Brazil is a Nine West and we are a size 8...then Sao Paolo and Rio (which we visited a couple years back) would be a pair of 8 1/2 black patent stilettos--stylish, glamorous, but maybe a tad too big. Ouch, blisters. We both decided we were ready to try something a little smaller on for size. Problem was we weren't exactly sure what we were looking for. We showed up at the Sao Paulo bus station, picked a bus to Curitiba which left in 10 minutes, and we were on our way. Curitiba was not love at first sight for us, or second or third for that matter, so we decided to hop another bus to a town called Paranagua. Paranagua certainly delivered on the small town Brazil experience we were in search of. Paranagua has a charming waterfront dotted with colorful bo ats, cobblestone streets lined with colonial buildings, but as much activity as college campus on a Sunday morning. Locals start filling cafes mid-morning, drinking large beers always served with their own coozies, and the popular per kilo buffets get cleaned out by 1pm. Paranagua's sole museum sits on the edge of town and is filled with an odd collection of "historical" items including old dental equipment, early computers, and Zack Morris-style cell phones. It's as if the museum curator asked everyone in town to bring in their old stuff and put it in glass cases. 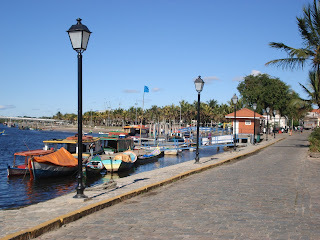 There is also Ilha dos Valadares to explore, connected by a footbridge from the marina. Even quieter than Paranagua, the island seems to have no actual businesses aside from people who use a spare room or garage in their home to sell snacks or beer to go. 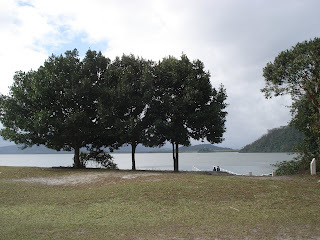 We had two places to call home in Paranagua. The first was Hotel Litoral, where we enjoyed our small, clean room with camouflage-print pillowcases for $25 per night. The included breakfast's quality depended on our timing: one morning we were offered only plain rolls with coffee and juice, another we got additional scrambled eggs, cheese and meat. Our second home was the fantastic sandwich pagoda we found on our first night and kept going back: Sanduba. The average price for a sandwich was $2 and they were absolutely delicious! We obviously were not alone in that opinion since the counter was always busy with people scarfing down sandwiches and intently watching Brazilian soap operas. Even more popular was the drive-up option. After eating we'd head across the street to the town gymnasium where we caught many a game of indoor soccer. 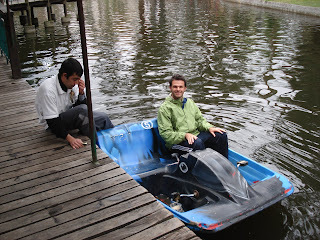 The real adventure began when we took a boat to Ilha Rasa. We saw banners in town advertising an annual festa on the island and boats leaving every two hours. We planned to take a morning boat, enjoy the party for a few hours, and then return to Paranagua to catch a night bus to Curitiba and on to Iguazu. Ilha Rasa didn't look that far on the map, but our rundown boat sputtered slowly through the bay, we got beached in too-shallow water a few times, and we stopped twice to deposit other passengers off on canoes and row boats that sidled up to our boat mid-water. Three hours later we arrived on a tiny island with a dozen or so houses, two churches, and a central dance hall that was being used as a bar for the festa. We sat down, polished off two beers and some cake, toe-tapped to the blaring samba music, and figured we'd better get to the dock and be on our way if we wanted to make that bus to Curitiba. Boat after boat arrived with more festa-goers, seemingly doubling the island's population each time, but much to our chagrin all of the captains responded in the negative when we asked if they were going back to Paranagua. With every shake of the head no the sneaking suspicion began to creep into our minds that something might have gotten lost in translation when we bought our boat tickets that morning. Finally a man who we recognized from our boat in the morning out to Ilha Rasa came down to the dock to explain to us, in Portuguese basic enough for us to decipher, that boats only traveled from Paranagua to Ilha Rasa on this particular day for the festa, and then returned the following day post-festa. That's right, we were stranded on the island for the night. You might have noticed the presence of hotels missing from our earlier description of Ilha Rasa. Luckily our bearer of bad news who we came to know as Rafael, was also the bearer of remarkable hospitality. He took us from the dock to his family's home, and they took us in for the night. They were so incredibly generous, making up a bed for us in their dorm-style sleeping quarters and feeding us every few hours with freshly fried fish, chicken stew, pork cutlets, empanadas, and more. They made us delicious caipirinhas and we sat with them for hours on their patio communicating in some way between Portuguese, Spanish and a little English. We had a wonderful time getting to know the extended family of 15 and are infinitely grateful for their hospitality. 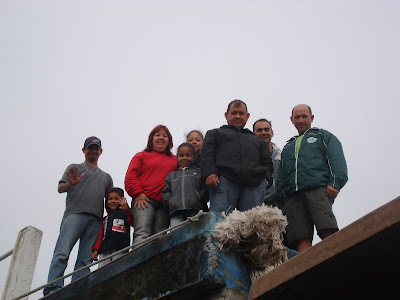 The next morning they all came down to the dock to send us off when the boats started heading back to Paranagua again. The ride back was filled with satisfied (and hungover) festa-goers returning to Paranagua. This island of 100 residents certainly did know how to put on a festa. With fireworks, bingo, and dancing, the party raged into the early morning hours. It was a relief to get back on the main land again. After parting ways with our hosts Rafael, Renata, and their adorable two-year-old son Matheus we were on our wa y again. We caught the next bus to Curitiba and got to spend the afternoon there before our night bus to Iguazu. The center of activity on a Sunday seemed to be the Passeio Publico with it's caged monkeys, flamingoes, and aquarium and small lake for paddle boating. We treated ourselves to a boat ride and bag of bacon popcorn. It certainly had been a tiring couple days but we used our exhaustion as an asset and slept like babies on our overnight bus to Iguazu, dreaming of home-made Ilha Rasa caipirinhas all the way. View more pictures from Paranagua here. I am surprised you didnt like curitiba! its a very beautiful city!! want to get justice and apt compensation for the personal injury. a victim. The case is settled via consent of both the parties in a civil suit. sustain up with attractive and ostensive. in one case you see it or provide it sit long. observe your title reach in front any line of contact sport!